The SS Central America was a steamship that traversed through between the eastern coast of United States and Central America in 1850. It was also known as the ship of gold because it was loaded with the gold of about 10 tons prospected in California during the height of the Gold Rush. 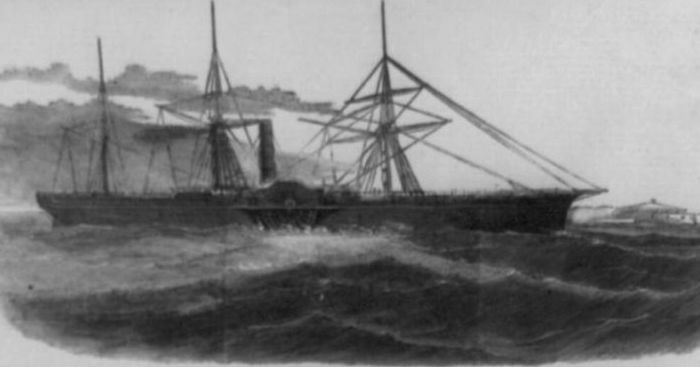 The ship was under the command of a captain known as William H Lewis with 477 passengers on board with almost 100 crew members it was headed to the New York City at the time of sinking, that according to the historical records the “Ship of Gold” was 85 meters long. In September 1857 she left the Panamanian port in Colon and made a stopover at the Havana. Eventually heading out to the open sea, it was faced with a heavy storm. According to records the hurricane was of Category 2, plenty powerful to take down a ship during that time. The origin of the problem was from the leak in one of the seals; it reached a point where its boiler stopped working due to the leakage, eventually this led to the dropping of the steam pressure and also stopping of the pumps which are normally known for giving stability to vessels on water. On the morning of 12th September, two vessels were spotted from far and this led to what seemed to be a rescue situation. Many of the passengers were rescued from the helpless ship, which was being controlled by waves of the storm pushing it far away from the rescue brig marine. At around 8 pm on the same evening the Central America sunk. Millions in gold dropped to the bottom of the sea. For years, treasure hunters dreamed of recovering the millions of dollars worth of gold that were stranded on the bottom of the ocean. However, the ships location was lost and only until recently modern history did we have the technology to make such a recovery. In 1988, a search was initiated to recover the gold. A recovery team used remotely operated vehicles (ROV) to search the seafloor in search of the shipwreck. The first successful search and recovery was done on September of 1988, and significant kilos of gold were recovered. The eventual recovery of gold was estimated to be in the range of 100 to 150 million dollars! This included spectacular discoveries such as a gold ingot that weighed 80 pounds! As with nearly all highly-publicized lost treasure discoveries, things started to get messy. The vast sums of wealth brought out the worst in people. Dozens of lawsuits were filed, with various people making claim to the newly found treasure. This included insurance companies who had paid out on the initial loss of the ship and gold in 1857. The leader of the recovery mission, Tommy Thompson, even went into hiding when many of the companies that financed the expedition sued him. There is still believed to be considerable amounts of gold still on the ocean floor at the site of the SS Central America. Some estimates put the total value of the gold on the ship at over 300 million dollars at todays gold prices. The sinking of the SS Central America is one of the most epic lost treasure tales out there. Not only was it true, but the recovery was also one of the largest in history.